1. The most common species of chipmunk found in the United States is the Tamias striatus. There are, however, 22 other recognized species of chipmunk. Some of the species are the Colorado chipmunk, the Siberian chipmunk, the Yellow-Pine chipmunk and the Cliff chipmunk. 2. On average, chipmunks weight between 1 and 5 ounces. They measure between 4 and 7 inches in length and they typically live to be between 2 and 3 years old in the wild. Their tail can measure between 3 and 5 inches. 3. Chipmunks often create long and complicated burrows that can measure about 10 feet in length. These burrows contain separate areas for storage, sleeping, and excreting waste. They keep the entrances to the burrows hidden very well. 4. A group of chipmunks is called a scurry. 5. Chipmunks communicate with each other through a variety of gestures and shrill chirping sounds. 6. While the chipmunk’s cheeks are rather small, they can get to be three times the size of the chipmunk’s head when they are filled with food. 7. A chipmunk typically breathes about 75 times per minute. 8. A single chipmunk can store as much as 8 pounds of food in one of its burrows. 9. The chipmunk will make one primary burrow that is used only for resting and giving birth. 10. The chipmunk’s most active part of the day is in the early morning and late afternoon. 11. The mating season for chipmunks is from February to April. Breeding season is during the spring and summer. A female chipmunk will have 4 or 5 babies each breeding season. 12. The diet of a chipmunk generally consists of berries, nuts, seeds and grains. During the autumn months, they will store these items up in their storage burrow so they can eat them during the winter. 13. Female chipmunks are called does and baby chipmunks are called kits, kittens, or pups. 14. While chipmunks do hibernate during the winter, they do not store their food as body fat. Instead, they come out of hibernation every couple of weeks to get some food from their storage. 15. 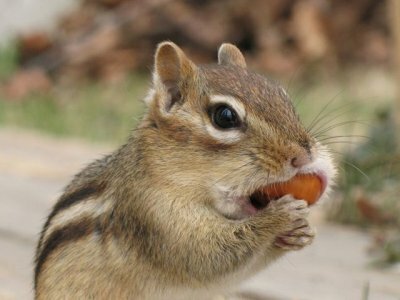 Although generally herbivores, chipmunks will also eat slugs, eggs, small birds, snails, worms and insects in addition to their plant-based diet. 16. A baby chipmunk is fully developed and ready to leave the litter by the age of 3 months. 17. Chipmunks use their expandable cheeks for carrying loads of dirt when they are digging burrows in addition to loading up food to store. 18. Chipmunks can live up to 8 years when they are in captivity. 19. The Panamint species of chipmunk lives in barren conditions with high heat. This is the only species that lives in areas like this. 20. The average chipmunk can only carry about 9 nuts in its mouth at one time. 21. Chipmunks have four toes on their front feet and five toes on their back feet. 22. When a baby chipmunk is born, it is blind and does not have any fur. It also weighs about 3 grams. 23. Chipmunks are part of the squirrel family. 24. The Alpine chipmunks are found mainly in Sierra Nevada and in Yosemite National Park. They are typically gray with brown stripes. 25. The chipmunk’s hibernation season lasts approximately from November to April. However, this can vary depending on the actual location and weather of where different chipmunks live.